Business View Magazine interviews Daniel Cano, a Project Manager at Belize Roadway Construction Ltd., as part of our series: best practices in Belize business. Belize Roadway Construction (BRC) Ltd. is a full service heavy construction company based in Belmopan, Belize. BRC’s emphasis has been in the construction and upgrade of roads to paved standard as well as the execution of civil works to support the oil exploration industry. However, BRC’s repertoire of projects ranges from land development, subdivision construction, earthmoving, aggregate production to placing hot mix asphalt. BRC was founded 13 years ago and has evolved from an earthmoving and land clearing company to a leading road building company in the country. In the past three years, BRC has executed over 15 major projects valued at over 13 Million US Dollars primarily for the Government of Belize through funding from various international development banks and agencies such as the Caribbean Development Bank, the European Union, and the World Bank. 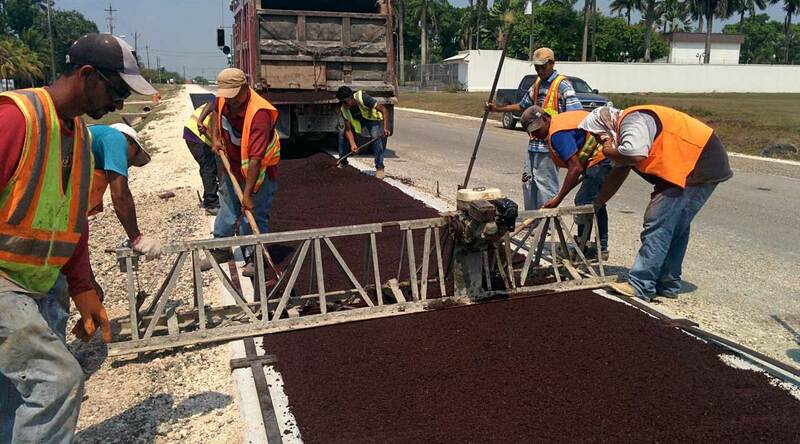 These projects have included major roads such as the Hopkins Stann Creek Road, the Belmopan Ring Road, and the Corozal Free Zone main road and have entailed significant improvements to the drainage and pavement layers of several miles of roadway as well as construction of high-strength concrete pavements, traffic light installation, and thermoplastic road markings. Some of the more specialized works BRC has undertaken are the completion of the Crique Sarco Toledo Bridge, and the extension of three bridges on the Hopkins Road, encompassing piling works, precast concrete beams, and concrete abutment and deck construction. In the private sector, BRC has completed numerous access road, drill platform, and cellar construction projects valued at over 10 Million US Dollars for oil exploration companies such as Perenco Guatemala, US Capital Energy, and Belize Natural Energy Ltd. In addition to heavy construction services, Belize Roadway Construction also offers premium limestone aggregates from its quarry located near Belmopan. BRC’s staff ranges from approximately 40 permanent, full-time workers to an additional 120 employees when multiple projects are underway. The geographical reach of its projects has increased over the years with most of the early projects in the Cayo District, close to BRC headquarters in Belmopan, to more recent projects as far away as the deep south for civil works to compliment the oil exploration industry, and in the north of the country with the upgrade of the Corozal Free Zone main road. WHO: Belize Roadway Construction Ltd.